Parents and offspring unite in this arresting portrait of a crane family. The fifth collaboration between Frost and Lieder (Wake Up!, 2017, etc. 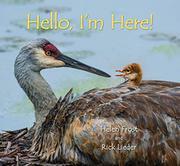 ), more than any of their prior ventures showcasing tiny creatures from the animal and insect world, here focuses on the tender familial relations of one species: the sandhill crane. As the author’s note highlights and Lieder’s signature photographs well illustrate, with an adult wingspan nearing 6 feet, this large marsh dweller is renowned among shorebirds for its distinctive vermilion-crested head, blazing saffron eyes, and tendency to mate for life. In clever counterpoint to Lieder’s stunning close-ups, Frost’s wee verse protagonist starts telling its tale while still in the egg, hearing its parents as it finally pecks through and its “shell falls away,” revealing a wide-eyed tawny chick with spindly legs, downy fuzz, and diminutive, pointy beak. Lieder’s silhouettes capture the chick’s dogged determination to make its presence known as well as its tentative first movements: “Could I stand up / straight and tall? / Will my legs hold me? / What if I fall?” Children will easily relate to Frost’s depiction of the chick’s daring inquisitiveness while simultaneously finding comfort in the affirming theme of constant parental guidance and caring.